Via Tyler Cowen, we have the chart on the right from Eric Crampton. 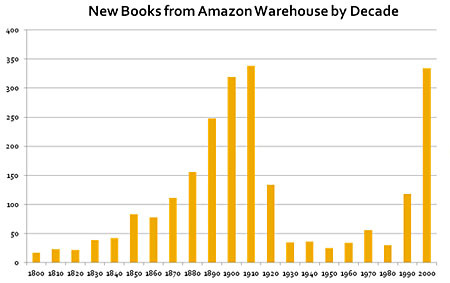 It shows book shipments [see update below] from Amazon by decade of publication, with a sharp dropoff in 1922 because books published before then are in the public domain while books published after that are still in copyright. (And probably will be forever since Congress keeps extending copyright protection whenever the current term is close to running out.) Presumably, people are buying lots of pre-1922 books because they’re cheap. In fact, lots of classic books are free in their e-editions. But there’s something about this chart that doesn’t feel right. If I believe it, people have bought as many books published in the 1910s as in the 2000s. Cheap or not, that just doesn’t seem plausible. That’s a helluva lot of copies of Ethan Frome and In Flanders Fields to compete with The Da Vinci Code and Harry Potter. There must be an explanation for this, but I can’t quite figure out one that sounds right. Any ideas? UPDATE: Sorry, I screwed this up because I hate videos and didn’t watch the embedded video that explains the chart. This doesn’t show shipment data, it just shows number of titles in the Amazon warehouse, taken from a random sample of 2,500 fiction titles. Out of those 2,500 titles, about 340 of them were published in the 1910s. So this doesn’t mean that Amazon is actually selling lots of books from the 1910s, which was a fairly dismal decade for classic fiction. It just means that Amazon stocks a lot of titles from the 1910s. This is still sort of surprising, but surprising in a different way. It also has a more obvious explanation: old titles that are out of copyright are very profitable for Amazon, so it’s eager to stock them even if they don’t sell in huge quantities. That says something about copyright, but perhaps not quite what we initially thought.